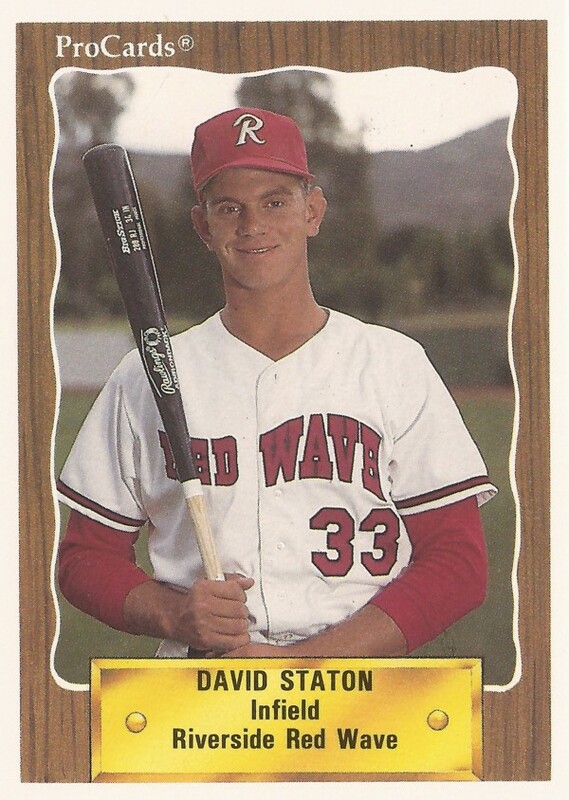 On his way to the majors, Dave Staton hit is share of home runs. By mid-April 1994, he had six in the majors over some 27 games. He tried to explain to The Los Angeles Times his long ball success. "I get lucky once in a while," Staton told The Times as the paper noted he smiled. "You catch the ball just right, and it goes out of the ballpark, and people like to watch that, but that's just an extra. I don't go up there trying to do it. Sometimes it just happens." For Staton, it seemed lucky he was there at all. Years earlier, blood clots caused by a rare disease almost ended his career before it began. Staton's career started in 1989, taken by the Padres in the fifth round of the draft out of Cal State-Fullerton. Staton found his home at Fullerton, after his first college didn't work out. Before that, the 15-year-old went against doctors' advice and played, despite the threat of life-threatening blood clots caused by lupus, The Los Angeles Times wrote. "Now that I look back, that was a pretty big step for a 15-year-old kid to be making," Staton told The Times in 1989. "But, if I was faced with the decision again, I know I'd do the same thing. I wouldn't blink." Staton played well enough at Fullerton to be a high draft pick for the Padres. He started with the organization at short-season Spokane. He promptly went out and won the Northwest League's triple crown. Staton hit .362, with 17 home runs and 72 RBI that year for Spokane. He then started 1990 at high-A Riverside. Disappointed in the assignment to Riverside, Staton started the year in a slump, but he recovered enough to make AA Wichita mid-season. Staton made AAA Las Vegas in 1991, then stayed there for 1992. Slowed by a rotator cuff injury, he played 1993 between high-A Rancho Cucamonga, Wichita and Las Vegas. That September, he made San Diego. Staton got into 17 games down the stretch for the Padres. He hit .262, with five home runs and nine RBI. His first major league hit: A home run. "It was one of the most thrilling moments of my life," Staton told The Associated Press the next spring of that home run. Staton ended up getting into another 29 games for the Padres in 1994, getting them in April and May. He hit just .182 and spent the rest of the season at AAA. Staton played one more season, but he didn't return to the majors. He played with the Brewers at AAA New Orleans, ending his career.